Volcano Art Center is proud to announce the exhibition titled Connecting Cords: The Hawaii Nei Invitational Exhibition on display 9am – 5pm, daily from July 8th until August 20th, 2017 at Volcano Art Center Gallery in Hawai’i Volcanoes National Park. 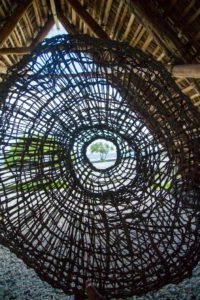 The multi-media exhibit showcases the work of eight different artists focusing on the fiber, form and function of Hawai’i’s cordage plants. The exhibit is open to the public and free of charge although park entrance fees apply. A special opening reception with the eight participating artists will be held on Saturday, July 8th from 5-7 pm at VAC gallery. The participating artists, including Howard Bradley, Lynn Capell, Gretchen Grove, Bonnie Sol Hahn, Heather Mettler, Aidan Murray, Dominic Tidmarsh and John Strobehn were each selected from the 2016 Hawai‘i Nei Exhibition celebrating native species. For this exhibit the selected artists were asked to represent traditional Hawaiian cordage plants including Nui (coconut), Hau, Olona, Wauke, ‘Ahu ‘awa, ‘Uki ‘Uki, ‘I.e. ‘I.e, Hue Hue, Koali ‘Ai (morning glory), and Hala. The plants, their origin, and the part of the plants used for cordage as well as where and how the plants grow, the fiber source of each plant, and how the cordage is prepared were investigated in a unique series of workshops hosted by VAC. “We are looking forward to displaying this diverse collection of art works”, states Gallery Manager Emily C. Weiss. “We already see that some artists have beautifully represented literal depictions of plants and materials while other have chosen to focus on the cord as a metaphor, the uniting factor that ties one to the environment, uniting us to each other and the community we create as a whole. 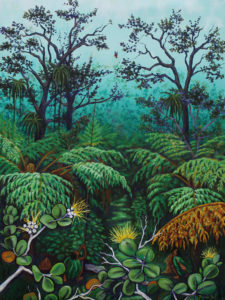 It will be interesting to see these new works which explore Hawai’i’s plant biodiversity and its connection to Hawai’i’s people both of the past and present. Gary Eoff, an artist and craftsman of Kona and Linda Pratt, a botanist of Volcano helped lead a series of workshops exposing these artists to their muse. Gary Eoff has resided in Kona, Hawaii since 1981. He works as an artist and craftsman, influenced by the rich Hawaiian culture and traditions. Inspired by the expert craftsmanship, high aesthetic and the natural materials used in the culture of old Hawai`i, Gary’s work is noted for its attention to detail, authentic design and process. Gary gathers his materials in a manner that sustains the host environment: always careful to nurture the plants and help to reproduce what was gathered. Linda Pratt has carried out botanical research in Hawai’i Volcanoes National Park for more than 25 years and is the co-author (with Charles Stone) of Hawaii’s Plants and Animals: Biological Sketches of Hawaii Volcanoes National Park. She holds a M.S. in Botanical Sciences from the University of Hawaii at Manoa and a B. S. in Biology from the University of Miami. She has worked with the U. S. Geological Survey, Pacific Islands Ecosystem Research Center, and Kilauea Field Station.